When it came time for us to move, one of my biggest worries was how Mason would adjust. Not only was I worried because he is older, and the older you are, the harder it is to start over- but I was also worried because he is so shy. Mason does not adjust to change well at all. He puts himself to bed, right on time, every night. He gets himself up in the morning and does his chores at the same time every day. He thrives on a constant routine. If you need to change things up for some reason, it's best with Mason if you give him as much of a heads up as possible and prepare him for what the change will entail. He's not big on surprises :) So taking all these things in to account, I was worried for him. In Idaho, Mason had a huge bedroom, all to himself. We lived on 2 acres and there was plenty of room for him to be alone when he wanted, and to play when he wanted. And his life was predictable, just like he likes it. Then we took him out of that life, threw him into a condo where he had to share a tiny little room with his brothers and no longer had a yard he could go out and play on. He had no space of him own- nowhere he could go to unwind. This is something that Mason spends a lot of time doing. Mason has always been a very good student. He is in 6th grade now and I've never had to worry about how he was doing in school. As this new year started, I hoped that would continue and I prayed he would get a good teacher. My worries seemed to be justified when I found out that just a few weeks into the school year, Mason's grades were already dropping. He was not turning in many assignments. Sometimes he would even complete them and then just leave them sitting on or in his desk while the rest of his classmates turned them in. He seemed lost. At his first parent teacher conference, his teacher expressed her concern as well. Together, his teacher, Dan and I, and Mason came up with some steps that we hoped would help him. His teacher had clued in to the fact that he was not adjusting well to the move. Instead of labeling him as a mediocre student (easy to do in a class of almost 40), she wanted to do everything in her power to help him adjust and succeed. As a parent, when you see a child's behavior change, and not for the better, it's scary. You can't help but wonder if it's the beginning of a long and painful road for your child. You know that you'll do whatever it takes to get them back on a successful path and to save them from any sort of a spiral downward. It doesn't matter if it's just 6th grade grades- you still worry- and you still do whatever you can to help as fast as you possibly can. To make a long story short, we moved into our house in November and at that same time, we implemented the habits and routines in Mason's day that we felt would help him to better succeed. By the end of the trimester, his grades were once again up to As. We are now halfway into the second trimester, and he has maintained his good grades. I have seen the efforts that his teacher is putting in, for him individually, to make sure he is successful. She has truly gone above and beyond her job description and has never treated him like "just another student". Over the last 2 months, not only did his grades raise, but he won his school Reflection's contest in literature for a poem he wrote, he won his class spelling bee and is now going to be competing against the rest of the grade and school, and he also directed a Greek play for his class and did a tremendous job on that. He is a member of the chess club and one of their strongest players. He has started basketball season and is loving that as well. He is truly a different boy than he was just a few months ago. Today, when I went to get the mail, I saw a note from his teacher. I didn't even read the envelope to see that it was addressed to him. I assumed it was to me since I am also his class mom. 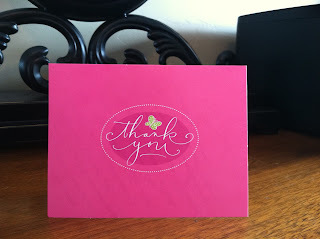 I opened the letter and inside was a Thank you Card. Thank you for the delicious chocolates- which were quickly consumed by me and my family- and the misteltoe soap- whose fragrance reminds me daily of you and Christmas! I am so happy you moved to Utah AND to my classroom. I know it has been difficult for you, but I am so proud of the way you handled it and of your successes. You have gained the respect and friendships of your classmates. You did a fabulous job as the director of your team's Greek play, and with your Reflection's poem, and the spelling bee and I could go on and on. You are awesome! This note will mean the world to Mason. He is so sensitive to the opinions of his parents, teachers and coaches. As my children have grown, I have seen that there is such a disparity between teachers. Teachers who truly love and care for each individual child are few and far between- and teachers who do so in the midst of budget cuts and overcrowding are even fewer. I know it's not an accident that Mason ended up in the class that he did. This was one of the many tender mercies we received when we took the leap of faith and made this move. I am forever grateful for those, and for this sweet teacher who has changed my son's life for the better. Anna, this is truly inspirational! A wonderful reminder that the Lord is aware of each of us, and that often times the angels we are given to help us roam this earth just like us. Thanks for sharing.